Through the link provided by most including Clean/Betaflight (https://www.st.com/en/development-tools/stsw-stm32102.html) we are presented with the line "Starting from Windows® 10, the STSW-STM32102 driver is no more adequate and the usage of the native inbox driver is recommended". Well I just want to know what this means. It seems to be the only driver I have yet to install for my flight controller and I am really hoping that driver is what is keeping me from connecting to my FC. Try the ImpulseRC driver fixer from here, this normally helps getting the flight controllers connecting! Had the same problem, and I hope Caroline's info will solve it. I did need this download but I had a corrupted windows 10 program or file. It appear to be working as it should no idea I had a problem. Reinstalled Windows 10 and all problems disappeared. You will need to download the file above though. Hope this info helps. I had that pleasure a couple of months ago, I didn't need to install any additional drivers to get my FC connected to the GUI. Flashing however required the driver fixer tool. Thought reloading win 10 was a feature they added that got done after every forced update. Win10 has actually been rock solid for me, it ran for almost 4 years with no problems. Compared to 95/98/ME which I usually reinstalled bi-monthly, it's been a dream. Is there a way to use Betaflight without constantly fixing drivers that doesn’t involve a Mac? Not used a MAc for Betaflight and not had an issue installing the DFU driver etc to connect the FCs. I have already tried the ImpulseRc and no dice. I have made attempts on my windows 10 on 2 different computers, windows xp, and Linux on my raspberry. I have treid 2 different naze32. I think I am ready to admit defeat. Maybe I just need to stick to fixed wing. Thanks any ways guys. The Naze 32 is a dinosaur of a FC. 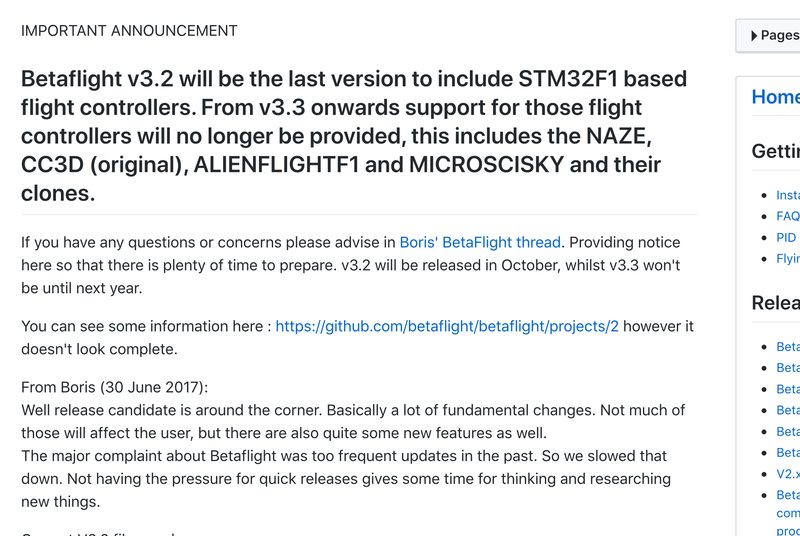 If I remember right Betaflight no longer supports it? Get an F4 board and it should all work? They are cheaper than new computers. It sounds like he is having connectivity issues rather than firmware issues. Even a Naze can still connect to betaflight, there are just no targets for the latest versions. OP: Does windows recognize that anything is plugged in? Does it "ding" at you when plugging in? If not, you may have a bad USB cable. Some cheaper cables are charge only, and don't have the data lines.